This photo from Chinese social network Weibo is believed to be a picture of Ge Ge. A poodle, which was transported from Beijing to Haikou on a passenger aircraft, was found shot dead at Haikou airport on Monday. Both the owners and animal rights supporters are outraged by the incident. The airport stated yesterday that the female dog, named Ge Ge, was shot after escaping its cage after the flight. The owners have remained skeptical about the details given. 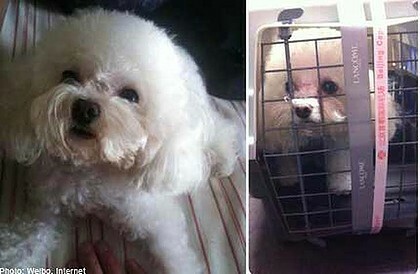 On Monday, a woman surnamed Ni traveled from Beijing to Haikou, Hainan Province by air, along with her pet, a 20 centimeter-tall poodle in a crate in the cargo compartment. After arriving at Haikou Meilan International Airport Monday afternoon, Ni was presented with her dog’s bloodied corpse. Zhou, Ni’s daughter was quick to post details of the accident on her microblog the same day, demanding an explanation from both Hainan Airlines, the carrier responsible, and the airport. The airport released a public statement yesterday afternoon, claiming that they had to shoot the dog, and that the action was "in accordance with the emergency plans for an animal invasion at the airport." "The door of the cage was loose after the journey, and the dog escaped while the cage was on the luggage carousel," the statement reads. Staff at the airport attempted to stop the dog but failed. At 4:35 pm, the dog was 100 meters from the active runway. "If the dog was sucked into the engine of an airplane, it may have caused damage to the aircraft and could have resulted in a fatal crash," the statement says. Hainan Airlines confirmed to Zhou that Ge Ge was killed by a single "long range shotgun blast" to the head, she said. The owners remain suspicious of the accident and are requesting even more details. "The cage is not broken, I suspect that someone opened the door and took her out," Zhou told the Global Times, "My mother also found other injuries, including swelling, on Ge Ge’s body." Animal rights campaigners are equally dissatisfied with the airport’s explanation and actions. Qin Xiaona, director of the Capital Animal Welfare Association believes that the airport acted in a completely unreasonable fashion. "The accident reflects a lack of humanitarian spirit and respect for life on behalf of the airport. If it was a person who rushed onto the runway, would they shoot them as well?" she added. Staff from Hainan Airlines visited Ni in Haikou yesterday afternoon, and showed her a 15 second clip of a dog rushing out of a cage while six members of airport staff try to control it. According to a disclaimer from the airline, the airline cannot be held responsible for the death of an animal if they are proven to have made no handling error. In her blog, Zhou demands a proper explanation, compensation, and demands that airports improve their animal cargo systems. "Every day, we have five to six pets on flights, but accidents are quite rare," an employee surnamed Liu from a Beijing-based pet delivery company told the Global Times yesterday. "Dogs perhaps escape from their cages if the door is not locked with iron bolts," Liu suggested.